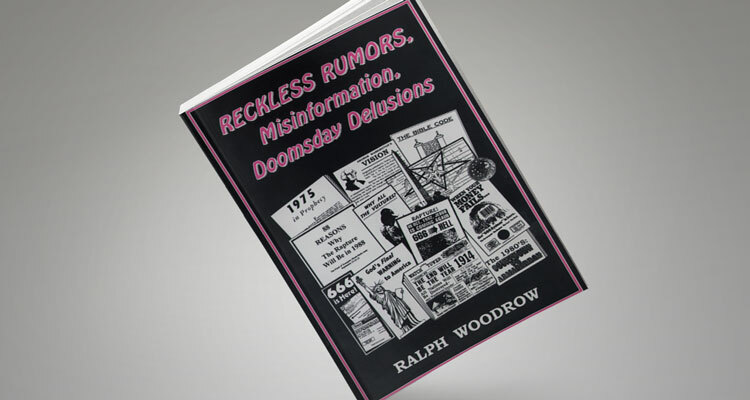 A thorough study of rumors, especially those that involve Christians in one way or another, written just prior to the year 2000. Did scientists accidentally drill a hole into Hell? How did one man convince vast numbers of people that he had obtained wood from Noah’s ark, when it was really from the railroad tracks behind his house? Was Aimee Semple McPherson buried with a live telephone? Did Janet Reno say on “60 Minutes” that a cultist is one who has a strong belief in the Bible and the Second Coming of Christ? Did Madalyn Murray O'Hair petition the FCC to have religious programs taken off the air? Do major companies like Procter & Gamble include Satanic messages in their logos? Do certain streets in Washington D.C. form an occult pentagram? Did George Washington have a vision about World War III? Is the monument that bears his name a phallic symbol? Did Ronald Reagan, as the first president to take the oath of office facing this monument, fulfill a “secret” Jesuit sign? Did Nostradamus predict Hitler’s rise to power in Germany and the death of Princess Diana—400 years ahead of time? Do the tiny letters JS on the American dime stand for Joseph Stalin? Why did Russian leader Nikita Khrushchev say, “We will bury you”? Did “the Jews” invent the polio vaccine in order to kill American children? Do members of the Knights of Columbus take an oath to kill Protestants and Masons? Why does the oath appear in the “Congressional Record”? Was there a valid parallel between Kennedy and Lincoln? Is every Bible version (except the King James Version) a “perversion"—put out by the New Age Movement? What about the “Bible Code”? Did the government accidentally mail out Social Security checks that required a mark in the hand or forehead for cashing? Have earthquakes increased during the last fifty years? Does the Bible say everything is getting worse and worse? This intriguing book shows how to separate fact from falsehood.